When it comes to transferring photos and videos from my Android Phone to my desktop or laptop, I always do not have the patient to go find and connect the cable to connect my two devices. Sometimes my laziness or let's say lack of patience makes me email the pictures from my phone to my own email so that I can access it from my desktop. I know that for transferring a large number of files, it is easier to use a cable connection between my phone and my computer. But for transferring one or two files, I do not always want to set up the wire connection. I was using email for that until recently I found an app called SnapPea. Now that you have this app, open it up. This app uses your Google account, so log into the app using your Google account. 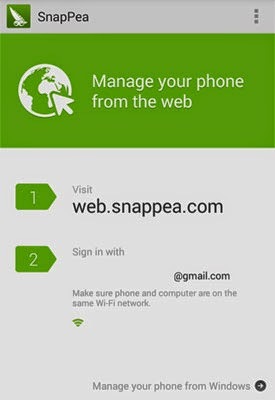 Open up the page web.snappea.com in your browser and login using the same Google account from that interface as well. You will not have to log in every time. Make sure your phone and your computer are connected to the same wireless network, your home WiFi. Now in your computer, select your phone and you will be shown thumbnails of all the pictures that you have in your phone. Click on them to enlarge them and save them easily to your computer. Besides transferring those pictures, you will also get access to your text messages. You can also send and receive text messages using your computer when you have your phone connected with SnapPea. Besides managing SMS, you can also manage your contacts and your apps. That means you can add and remove contacts in your phone. You can also install apk apps or uninstall the ones that you already have in your phone. This is my favorite app for transferring a few photos from my phone to my computer. You might find it useful for managing different features of your phone from your computer.